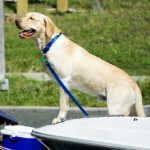 Everyone wants to take their dog on a camping and/or fishing trip. This Quick Guide looks at some of the ways you and your man’s best friend will stay healthier and happier when you get outback. Dogs can’t tell us they are thirsty. Shade and water are a must for your dog just as much as they are for you. Excessive panting is a sign that your dog needs water. Dogs should not be allowed to drink standing water as it can harbour parasites and bacteria. The same rules apply to dogs as it does to us humans. Boil any natural water before you and your dog drink it. Keeping your dog supervised is essential. If you cannot supervise your dog at all times, you will need to keep it restrained on a leash. 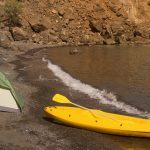 Know the rules of the camping site you are staying and if you are way outback, understand the responsibility of supervision. 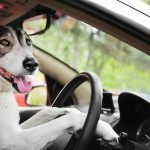 Dogs that are not used to being in the great outdoors can get themselves into trouble very easily. If you think that letting your dog roam free is the right thing to do, think about what can go wrong from a snake bite or a bite from another very unfriendly critter. Pets love to sleep more than most people realise. They are not laying around because they are bored, they really do need to sleep more than us. By bringing something from home your dog usually sleeps with, your dog will be a whole lot happier during your holiday away. 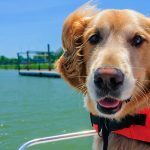 Some of the best pet beds and dog beds for the home are portable and perfect for camping and fishing trips. If you had super-human hearing you would have a lot to make a noise about. Dogs are excellent for protecting us against danger. We don’t want to tell them off for barking but we do want to give them a distraction from barking without reason. Temperatures can plummet at night even during the hottest of days. Your dog bed or pet bed will provide some comfort but there is nothing like having the shelter of a tent. If you are not used to sleeping with your dog, a small piece of tarp underneath your dog bed will keep it dry and warm overnight. We all love the stories where a lost dog finds his or her way home no matter how far away it was. In reality, most of them don’t. If your dog is found, it may take some time to locate you even if you have an electronic tag. The easiest way is to tag your dog with your details so you can be contacted by a simple social message or by a phone call. Make it easy for anyone and everyone to find you. Dry dog food is the healthiest for your dog. Dinner leftovers are never good for any pet. Make sure you pack enough so your dog is occupied when you eat and has the habit of eating dry dog food wherever you go. Dogs can’t tell us if they have been bitten or have been scratched. It is important to check them over at least once a day or each time you have been out from your campsite. Make this a routine that you and your dog enjoy. Always check his or her paws. 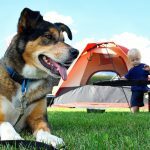 Do you have your own hacks and tips to having a better time when camping with your dog? Share them in the comments section below.